As you wander through the green park setting in Elmira, Ontario you will come across a war memorial adorned with flower wreaths. A war memorial stands amongst the green trees in the small town of Elmira, Ontario where people come to remember the heroes of our land. Beautifully colored wreaths are still placed around the base of the war memorial and visitors to Elmira, Ontario always stop to read the inscriptions. War memorial in Elmira, Ontario, Canada, North America. 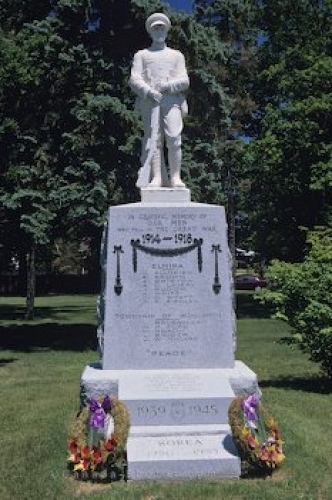 Picture of a war memorial in the small town of Elmira in Ontario, Canada.